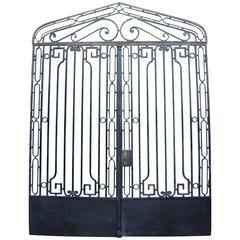 1920s cast and wrought iron gateway arch with Art Nouveau details and a black finish. This can be seen at our 2420 Broadway location on the upper west side in Manhattan. 1970s pair of wrought iron Art Nouveau style gates handmade in France. Priced as a pair. This can be seen at our 5 East 16th St location on Union Square in Manhattan. 1920s original ornate balcony railing with amazing hand-wrought iron detail and a hollow metal top. Has rust. This can be seen at our 400 Gilligan St location in Scranton, PA. These gates are in good structural condition. Weight 280 kg. 5 black enameled cast iron fences with Art Deco stylised fruits baskets.Can be separate and sold as individual items. A run of eight pairs of 1920s turned ebony door handles, with brass collars on rectangular backplates. English turned oak and brass door knobs, circa 1920. Sold as pairs, in good working order ready to use.